Burndy Hylug™ Type YAV-L BOX 1-Hole Compression terminal lug has voltage rating of 600-Volt - 35-Kilo-Volt and accommodates stranded copper conductor of size 6-AWG. 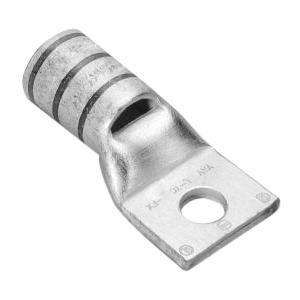 This 1.28-Inch long terminal lug features copper construction with electro tin-plated finish. It includes 1/2-Inch long strip, 1/4-Inch stud, a peep hole and 0.5-Inch wide ring/straight tongue. The standard beveled barrel with inspection window, allows quick insertion of cable. Terminal lug is UL listed, CSA certified and RoHS compliant.